The last month or so has been a big test for the newly adopted Midtown Plaza Area Plan. First, the City Council upheld the tight density limits imposed on the Plaza, rejecting two requests for rezoning. While many pro-development urbanists (including me) were disappointed to see a dense redevelopment proposal rejected, it was nevertheless encouraging to see the Council aggressively defend an area plan. Today, the plan faces another test, and the developer’s intentions are far less urban. 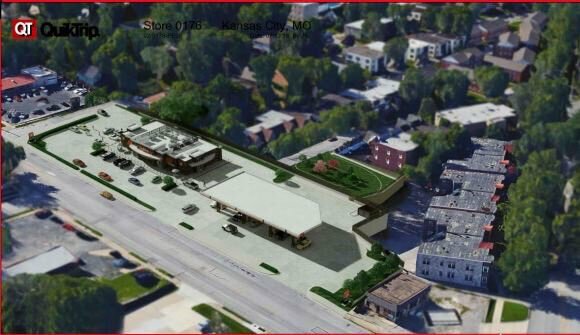 Case 14730-MPD goes before the City Plan Commission in an effort to create a mega-QuikTrip on a busy urban arterial in Kansas City. This development plan requests vacating a public street and creation of a megablock to expand the capacity of an insanely busy store at Westport Road. QuikTrip really doesn’t understand urban, if this image didn’t already make that painfully clear. As a former employee, I had the opportunity to work at Store #227 at Southwest Boulevard and 31st Street. The store was wildly busy, as are its other Midtown stores. Because of sheer amount of revenue that these stores pull in, employees at the store don’t (or didn’t, at the time) qualify for bonus “urban pay” – which is determined by the relative number of 911 calls in the area. You, like me, might take offense to the use of “urban” as code for high crime. But what’s more offensive is that QuikTrip doesn’t realize what a goldmine of an opportunity they are sitting on at their urban locations. I would argue that QuikTrip’s urban stores are successful in spite of – not because of – their out-of-context site design. The economic density of its urban stores vastly outweighs that of its suburban stores, even on busy freeways. And quality convenience stores are few and far between in the city, thanks largely to retail location models that significantly under-count urban demand, meaning there aren’t many competitors. Imagine what kind of success their urban stores would have if the physical design of their stores actually responded to the surrounding context. After all, the real profit advantage its locations have are in its in-store convenience goods, not the gas pumps outside (as QuikTrip is only a gasoline retailer, not the owner of refineries or wholesale outlets). A store can handle far more customers in a walkable, dense, urban environment than it can if it has to build a large parking lot on a car-congested street. And that’s precisely what the Midtown Plaza Area Plan aims to do. Westport Road is a challenge from this standpoint. While it is very urban, with zero-lot line commercial development, dense historic neighborhoods, a mixture of commercial and residential uses, and a connected street grid, there are a number of places where this urban quality is eroded. The unnecessary width of Westport Road that leads to excessive speeds, the high number of driveway access points, and the poor pedestrian amenities make it very difficult to walk on Westport Road. A handful of developments have significant set-backs, placing parking lots (and therefore, customers with cars), before the front doors of their businesses. So, if you happen to walk from your apartment to get a cup of coffee, a used book, a screwdriver, or an enchanted taquito, then be prepared to dodge traffic, watch your back as you cross a driveway (there’s no way that driver making an unprotected left turn into that driveway will notice you when s/he’s got all of that oncoming traffic to look out for), and walk through a small sea of asphalt before you get to the front door of the business you want to spend your money at. Recognizing these deficiencies in the public realm along this stretch of Westport Road, the Midtown Plaza Area Plan calls for redevelopment into the “Mixed Use Community” typology, described on page 28 of the plan. To its credit, the staff report for this case identifies fourteen different reasons why the development plan fails to live up to area plan goals. Perplexingly, it still recommends approval without demanding a remedy to the most fundamental violations of the area plan. This is frustrating, because the particular rezoning that QuikTrip is requesting is meant to give staff planners the highest amount of control. Yet in this Master Planned District (MPD) rezoning case and in many other MPD cases throughout the city, we see urban design standards relaxed rather than strictly enforced. The City’s zoning code is set up so that not every proposal has to go through a highly scrutinized legislative process. As long as a project fits within a range of acceptable uses and meets basic site design criteria, it usually only receives administrative-level review (some proposals that meet basic criteria also require a public hearing and City Council approval, if they’re large enough). This particular site is zoned B3-2 – a commercial district that allows gas stations with a Special Use Permit. Rather than being permitted as of right, uses categorized as special use permits require approval based on an additional set of criteria. Staff analyzes the proposal and writes a report to the City Plan Commission. But then, the City Plan Commission, rather than making a recommendation to the City Council (as in a rezoning), makes a recommendation to the Board of Zoning Adjustment – an appointed body. This is theoretically an important distinction, as the BZA is an apolitical body. Its members don’t have to run campaigns to keep their much-envied jobs. The City Council, on the other hand, approves all rezonings, including MPDs, and so this process is somewhat more susceptible to politics (especially considering campaign donations made to members of the committee that reviews cases like this). In fairness, there are some practical reasons for an MPD rezoning – a street vacation, replatting, and rezoning can occur in a single legislative act. But the MPD designation does raise the question: what is the (non-cynical) purpose of an MPD? Are they, as section 88-280-01A outlines, to promote natural resource protection, traditional urban development, mixed-use development, or mixed housing development? Clearly not. Any of the specific progressive development goals outlined in 88-280-01B? Not really. The staff report cites the MPD ordinance, saying the district is “intended to accommodate development that may be difficult if not impossible to carry out under otherwise applicable zoning district standards.” There are two problems with that. First, there certainly are other applicable zoning districts, including the current zoning district. Second, it’s unthinkable that the people who drafted the development code, after carefully crafting each district with unique lot and building standards and use standards thought that there should be a mechanism to disregard all of it. This is the trickiness of special zoning districts – and of a rezoning in response to one development proposal at a time. It’s probably a smart thing to maintain a level of flexibility in the development code to accommodate changes over time. I’ve argued for flexible zoning (and rigid area plans) before. But at what point does the public benefit of zoning erode entirely due to actions inconsistent with its stated goals? Public benefit is the foundation of zoning. It’s so critical that the authors of Kansas City’s development code made sure to clarify that MPDs were to be used only if there is greater public benefit than could be realized with conventional zoning. Fortunately, we don’t have to sit and guess at what public benefit means. It’s defined in our comprehensive and area plans. These documents are often accused of being wishy-washy and toothless, yet they are the foundation of the City’s ability to control land use at all. The staff report very clearly states the ways that the public benefit criteria outlined in our area and comprehensive plans are not met. If the City Council approves this MPD, they not only threaten the integrity of a the neighborhood – they undermine the justification for their ability to regulate land use at all.